Prof. Christian Hopmann and Dr. Brian Grady, SPE President 2018-2019 at Society’s 77th Annual Technical Conference (ANTEC® 2019) in Detroit, MI during ACCLAIM - A Celebration of Inspiring Plastics Professionals. Honoured for: Outstanding contributions in the field of plastics engineering, science or technology, or in the management of such activities. SAMPE Innovationspreis awarded to Jonas Müller, M.Sc. Award winner: Jonas Müller, M.Sc. Award winners: Daniel Schneider, M.Sc., Matthias Heck, M.Sc. Honoured for: "Infrared welding of highly filled graphite composites"
Published in: ANTEC 2018. Proceedings of the 76th Annual Technical Conference & Exhibition, Orlando, FL, May 07-11. Society of Plastics Engineers. Honoured for: Dissertation on the topic "Process development for the production of continuous fibre-reinforced polyurethane blow mouldings using the projectile injection technology"
Honoured for: Dissertation on the topic "Mechanical material characterisation of engineering thermoplastics under very high load velocities"
Awardee Florian Petzinka and Kevin R. Slusarz, US Exruders, Inc.
Honoured for: "Investigation on the effects of the processing parameters on the replication quality of micro-structures in the extrusion embossing of polycarbonate films"
FSK Innovation award for polyurethanes 2017 in the category "Technology - Processing and Cemistry"
Award winner: Lorenz Wruck, M.Sc., and Benedikt Kilian, M.Sc. 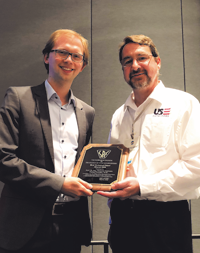 Honoured for: Paper on the topic „Inverse thermal mold design for injection molds"
Honoured for: Dissertation on the topic "Technical Development of an Alternative Plasticising Process for the Injection Moulding of Plastics Micro Parts"
Award winner: Jens Wipperfürth, M.Sc. Honoured for: Paper on the topic „Ultrasound tomography for spatially resolved melt temperature measurements in injection moulding processes"
Honoured for: Dissertation on the topic „Simulated and experimental determination of viscoelastic die swell and numerical flow channel optimisation in extrusion"
Award winner: Nadine Magura, M.Sc. Honoured for: Master's thesis "Analysing the potential of an adhesive-free, cohesive bond to a thermosetting-thermoplastic hybrid"
Honoured for: Development of the "sandwich pultrusion process"
Award winner: Jakob Onken M.Sc. Honoured for: Master thesis on the subject "Development of conductive plastic compounds with increased impact strength"
Awarded paper: "Degradation of Microcellular PLGA-PEG Copolymers for the Use in a Drug Delivery System fot the Urinary Bladder"
Published in: ANTEC 2015. Proceedings of the 73th Annual Technical Conference & Exhibition, Orlando, FL, March 23-25. Society of Plastics Engineers. 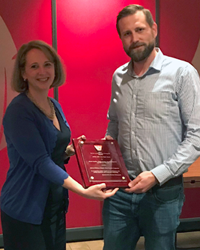 Award winner: Nicolai Lammert, M.Sc. The awarding of the certificate by the Chairman of the ZENIT e.V. network, Dr. Otmar Schuster, 2nd from right, top | photo: ZENIT e.V. 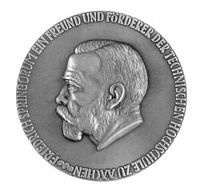 Ausgezeichnet für: das Forschungsprojekt "Individualized Production in Die-Based Manufacturing Processes Using Numerical Optimization"
Verliehen durch: AVK – Industrievereinigung Verstärkte Kunststoffe e.V. Preisträger/innen: Eva Nettesheim M.Sc., Maria Regina Riedel M.Sc., Nafi Yesildag M.Sc. Verliehen durch: SAMPE Deutschland e.V. Awarded paper: "Laser Welding of Incompatible Semi-crystalline Thermoplastics by Means of Intermediate Layers"
Published in: ANTEC 2012. Proceedings of the 70th Annual Technical Conference & Exhibition, Orlando, FL, April 2-4. Society of Plastics Engineers. Awarded paper: "Effects of the Foam Morphology in the Mechanical Properties of Injection Molded Thermoplastic Foams"
Published in: ANTEC 2008. Proceedings of the 66th Annual Technical Conference & Exhibition, Milwaukee, WI, May 4-8. Society of Plastics Engineers. Published in: ANTEC 2009. Proceedings of the 67th Annual Technical Conference & Exhibition, Chicago, IL, June 22-24. Society of Plastics Engineers.